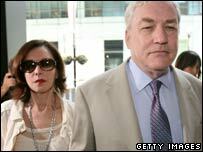 Disgraced media tycoon Conrad Black will appeal against his convictions for defrauding millions of dollars and obstructing justice, his lawyer says. Former Daily Telegraph owner Black, 62, faces up to 35 years in jail after a three-month trial in Chicago. But his lawyer, Edward Greenspan, said he was confident there were "viable legal issues" to appeal against. The verdicts cap a remarkable fall from grace for Black, once one of the UK's most influential media figures. Canadian-born Black, who was allowed to remain free on a $21m (£10.5m) bond, was found guilty on three charges of fraud and one of obstructing justice. Juror Tina Kadisak told the Chicago Tribune newspaper the jury's decision was based on the accumulation of evidence presented over 14 weeks. There had been no "smoking gun", Ms Kadisak said, but a video showing Black removing boxes of documents from Hollinger's Toronto offices in violation of a judge's order had been important. The jury cleared him of eight further fraud counts and one charge of racketeering. "There wasn't enough evidence there. There just really wasn't," Ms Kadisak told the Tribune. Judge Amy St Eve adjourned Black's bail proceedings until Thursday to allow his defence team to consult Canadian lawyers. Black, who gave up his Canadian citizenship to sit in the UK's House of Lords, is due to be sentenced on 30 November. Mr Greenspan said: "We came here to face 13 counts. 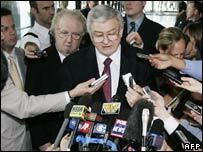 Conrad Black was acquitted of all the central charges. They have been dismissed. "We believe, based on the conviction of the charges here, that the sentences for this type of offence are far less than what the government suggested." The jury took 12 days to reach a verdict, and prosecutor Patrick Fitzgerald said he was "gratified" by their decision. "We think the verdict vindicates the serious public interest in making sure that when insiders in a corporation deal with money entrusted to them by the shareholders, that they not engage in self-dealing," he said. Former colleagues of Black, who was boss of the global publishing group Hollinger International, said he would find prison extremely difficult. Dominic Lawson, former editor of the Sunday Telegraph, told the BBC: "He is, as was made clear during the trial, used to a very luxurious life. "On the other hand, you will have noticed that in the period running up to the trial he managed to write and publish a 1,000-page biography of Richard Nixon. "So he's clearly someone who can write and work and think under extreme psychological pressure." Black's biographer, Peter C Newman, said the tycoon would struggle to come to terms with his guilt. "He can't understand why he didn't get away with it and why the court has done what it has done," he told the AP news agency. Legal experts were doubtful about Black's chances of a successful appeal. Andrew Stoltmann, a Chicago lawyer who was following the trial, said Black could be thankful he was not convicted on all counts. "Certainly there are a whole bunch of appealable issues, but it's unlikely that he'll be successful," he said. Joshua Rozenberg, legal editor of the Daily Telegraph, said that although he had been cleared on several charges, the convictions for fraud were damning. "It only takes one fraud charge and the man is disgraced and finished," he said. "He is clearly facing a lengthy prison sentence." Three of Black's associates - Jack Boultbee, Peter Atkinson and Mark Kipnis - were also found guilty of fraud. The allegations focused on Hollinger's strategy of selling off small community papers in the US and Canada. In return for promises that Hollinger would not return to compete with the new owners, Black and other executives pocketed $6m (£3m) in payments which should have gone to shareholders. Black was also convicted of obstruction of justice after he was caught on film taking 13 boxes of documents from his Toronto office in defiance of a court order. Hollinger's newspaper empire once spanned the globe, including titles such as the National Post of Canada and the Jerusalem Post. Did Conrad Black get off lightly? What next for 'Lord Fraud'?